The Adelante First Year Experience program hosted their “WOKE WOMXN’s Conference” as part of an inaugural Empowerment Summit series complete with multiple keynote speakers, workshops, panels and performances. “The Empowerment Summit Series is a fundraising event with the goal of establishing an Adelante Scholarship program for FYE scholars,” Associate Dean of first year programs Vanessa Ochoa said. 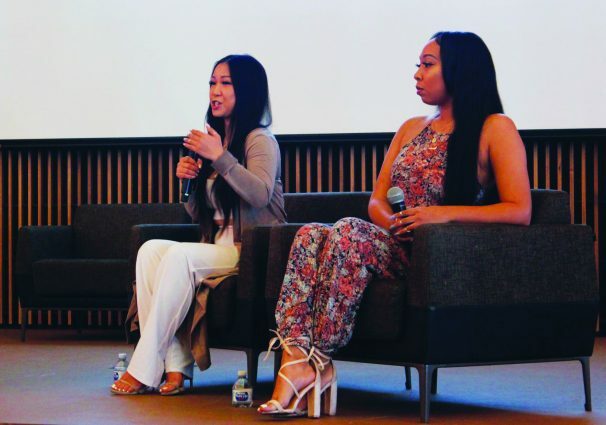 The first of the series, WOKE WOMXN Conference, featured five female keynote speakers with merit in their respective fields, two empowerment panels, networking opportunities and a flamenco dance performance. As for the “x” in “womxn,” Adelante student ambassador and organizer of the conference, Lizbeth Ventura, explained “Spelling Womxn with an “x” emphasizes that womxn are empowered and also highlights the inclusion of transgender womxn, womxn of color, womxn from diverse cultures, and all self-identifying womxn,” Ventura said. Keynote speakers were Gabriela Ortega, an actress, writer and USC alumna with roots in Hollywood, Denisse Cobian, media representative from Mitú, Lupe Fuentes, House Music DJ, producer and owner of the record label, “In the Loop” and street muralist, Sandoner. During her time on stage, Sandoner spoke upon her struggles as a person of color, as a woman in the arts industry and the difficulty of growing up working class. Sandoner promoted self-love and self-determination and said success comes from persistence. She has been in the industry for five years and only during the fifth year has she made enough money to feed herself. “Now I sell art, when I used to sell tacos!” Sandoner said. Panel speakers were Monica Lin and Kiona Stowers, co-owners of Eyelust Eyewear and marketing directors for Popular Demand clothing, and Mujeres De La comunidad, Marcela Lozano, Vanessa Ochoa, and Marcela Mendoza. Both panels were interactive and emphasized chasing your dreams regardless of criticism. The role of men was also discussed, but it wasn’t negative. “All they need to do is be supportive.” says Lin. “It is important for men to be there, but we need to tell them how to help us,” Ochoa continued in the next panel. The WWC ultimately provided empowerment to students and staff of all backgrounds. In addition, there was a resource fair featuring the ELAC Health Center, Safe Zone and the East Los Angeles Women’s Center. The next event in the series is ELAC Pride Week which will empower scholars through advocacy skill development and access to resources. Pride Week will be four days long from April 23 through April 26 in the MultiPurpose Room.